This week saw the best men’s footballers from Ireland and Australia’s native football codes take part in the hybrid series of International Rules. The series saw two close matches that was well received by crowds at the game and on TV. So if the best men of the game can represent their country in this format surely the women can take part too? In fact they did back in 2006. 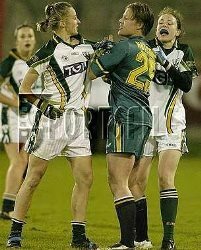 Julia Boyle who played for Australia in the 2006 Women’s International Rules Series against Ireland told me, “it was the biggest highlight of my football career. I had played both Gaelic Football since I was 17 and VWFL since I was 19, I had represented Victoria in both Codes and had also won two World Cups for Australia in Gaelic Football. I had pretty much retired from AFL in 2002 after Parkside folded and was just playing /concentrating Gaelic Football. When word got around that the series was going to happen, I started playing AFL again." "It was very hard juggling commitments to both codes, often having to play two matches on the one day. I remember the 5 months leading up to the selection trials in the July 2006 I lost nearly 25kg, and I was the fittest I had ever been. The quality of the players that were selected Australia wide were the best in the country at the time, so it was very competitive in selection”. Coverage of the second of two IRS Tests between Australia and Ireland will kickoff at 4.45pm in Perth on Sunday local time. The match will be broadcast on limited overseas networks. It will also be streamed live on the Watch.AFL service, available by subscription. 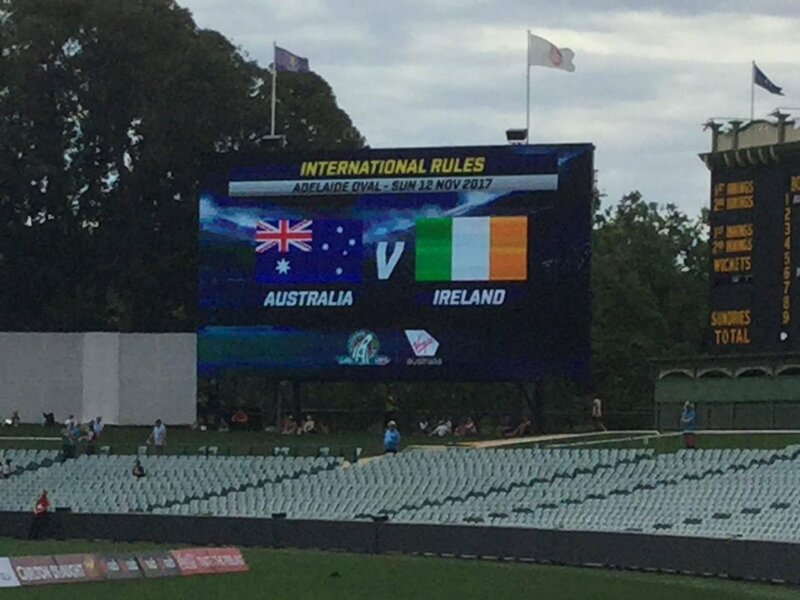 In hot and mostly overcast conditons at Adelaide Oval the Australians scored 2 goals, 13 overs and 12 points (63 ) to Ireland's 1 goal, 13 overs and 8 points (53) to take a 10 point lead into next week's second test at Subiaco Oval. The Irish lead at quarter time but the Australians worked back to a one point lead at half time. The Australians then dominated the second half of the match despite the constant scoring efforts from the likes of Murphy and McManus for Ireland. Scott Pendlebury looks to have suffered a possible broken hand and may miss for the Australians in Perth. A full match report from Frederick Shaibani to follow. The first of two IRS Tests between Australia and Ireland will kickoff at 3.40pm in Adelaide on Sunday local time. The match will be broadcast on limited overseas networks (not including North America). It will also be streamed live on the Watch.AFL service, available by subscription. It’s less than a month from the opening test of the International Rules Series, and the GAA has officially announced who will be representing Ireland at the 2017 test matches, which will be held on November 12th (Adelaide Oval) and 18th (Subiaco Oval). County Mayo GAA leads the way with four selections -- Aidan O’Shea, Chris Barrett, Brendan Harrison, and Pearce Hanley, a former Mayo footballer who now plays for the AFL’s Gold Coast Suns. 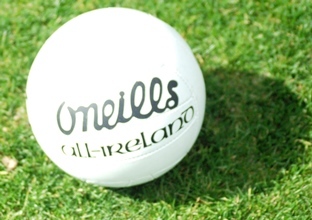 Mayo’s Gaelic football team were runners-up in the 2017 All-Ireland Senior Football Championship, as they lost the final to County Dublin. County Kerry, another perennial GAA contender, will be sending three players to Australia to compete in the IRS -- Paul Murphy, Paul Geaney, and Peter Crowley. The 2017 All-Australian squad has been official but secret since August 28th, but the AFL has now revealed the 17-man team that will compete in the International Rules Series (IRS), which will comprise two test matches, one to be held on November 12th at Adelaide Oval, and the second to be played at Domain Stadium in Perth on the 18th. To say that this year’s Australian side is star-studded would be an understatement. Prior to this year, this group has collected a combined 34 All-Australian honors, 10 AFL premierships, four Brownlow Medals, one Norm Smith Medal, five AFLPA MVP awards, and nine AFL Rising Star nominations. In addition, Eddie Betts, Paddy Ryder, Chad Wingard, and Shaun Burgoyne have made a combined eight appearances with the Indigenous All-Stars.